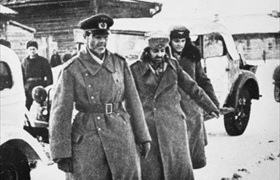 On this date in 1942 the Soviets kicked off Operation Uranus, Phase I of the Red Army’s en­circle­ment of Gen. Fried­rich Paulus’ Sixth Army (the single largest Ger­man troop for­ma­tion), as well as the Ger­man Fourth Panzer Army and the Third and Fourth Roma­nian armies at Stalin­grad (today’s Volgo­grad). 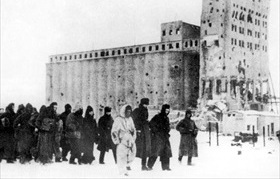 The Soviet high com­mand had waited for the arrival of sub­zero tem­per­a­tures (‑22°F) to harden the ground for their rolling armor and for the Novem­ber Allied landings in North Africa (Opera­tion Torch) to tie down Ger­man reserves in the West before begin­ning their offen­sive. The Soviets had over one million men, more than 13,000 guns, nearly 900 tanks, and 1,400 air­craft to throw against the worn-out, dis­pirited Ger­mans and their under­strength and poorly equipped Axis co­horts. The Soviets, under the leader­ship of Col. Gen. Alek­sandr Vasilev­sky and Gen. Georgy Zhu­kov, closed their double-pincer trap four days later. In Janu­ary 1943, the Red Army began sys­tem­at­ically de­stroying the trapped Axis forces. At month’s end Paulus capit­u­lated. Ger­man loses in the Stalin­grad pock­et amounted to 20 divi­sions and over 150,000 men (some esti­mates are as high as 201,000 men), 24 generals, and one newly minted field marshal (Paulus). Losses and casu­al­ties among the Roma­nian and Ital­ian forces on Paulus’ flanks were even greater. Roma­nian losses approached 158,000 out of an initial 228,000. Ital­ian losses were 114,520 out of the orig­i­nal 235,000 sol­diers. For three days straight, Ger­man radio sta­tions played nothing but som­ber music. Sol­diers who had pa­raded 40 months ear­lier in tri­umph through War­saw’s streets were now either dead or stum­bling—dishev­eled, hun­gry, some wounded, many frost­bitten—into an un­cer­tain fate in Soviet cap­ti­vity. (Less than 6,000 returned home from their ordeal.) Allied nations rejoiced with the Soviets, given the enor­mity and ob­vious stra­tegic impli­ca­tions of the over­whelming Axis defeat. Indeed, the requi­em for Hitler’s Third Reich was heard loudly even in Berlin, drowning out Pro­pa­gan­da Minis­ter Joseph Goeb­bels’ Sportpalast speech to 14,000 care­fully selected Ber­liners. Stalin­grad had opened the eyes of the nation “to the true nature of war,” he said on Febru­ary 18, 1943. Ger­many’s future hung in the balance in the east, and “total war is the demand of the hour.” Happily for the Allies, time was not on Germany’s side. Left: Prisoners of war Field Marshal Friedrich Paulus and two staff mem­bers meet at the head­quarters of Soviet 64th Army Chief, Lt. Gen. Vasily Chui­kov, Janu­ary 31, 1943. Ironically, Chui­kov was in Berlin in April and May 1945, where he was the first Allied officer to hear of Adolf Hitler’s April 30th suicide. He accepted the surrender of Berlin’s garrison from Gen. Helmuth Weidling on May 2. Right: German troops as prisoners of war, 1943. In the back­ground is the heavily fought-over Stalin­grad grain ele­vator. Out of the nearly 110,000 Ger­man pri­soners cap­tured in Stalin­grad, only about 6,000 ever returned. Already weakened by dis­ease, star­va­tion and lack of medi­cal care during the en­circle­ment, they were sent on bru­tal marches (75,000 survi­vors died within 3 months of cap­ture) to pri­soner camps and later to labor camps all over the Soviet Union. Some 35,000 were even­tually sent on trans­ports, of which 17,000 did not sur­vive. Most died of wounds, dis­ease (particularly typhus), cold, over­work, mis­treat­ment, and malnutrition. Left: As the tide of war seemed to turn against Germany and its Axis allies following Stalin­grad, Joseph Goeb­bels felt com­pelled to steel the Ger­man people for coming hard­ships. At a rally on Febru­ary 18, 1943, at the Berlin Sport­palast, the nattily attired propa­ganda minis­ter addressed a large, care­fully selected audi­ence of Nazi true believers, among them sol­diers (some wounded), doc­tors and nurses, scien­tists, teachers, and blue-collar muni­tions workers. Behind him and over­head was a huge ban­ner in block letters: “Totaler Krieg—Kürzester Krieg” (“Total War—Shortest War”). He asked his audi­ence, including those listening by radio, “Do you want total war? If neces­sary, do you want a war more total and radi­cal than any­thing that we can even ima­gine today?” The crowd shouted its assent. “Are you deter­mined to follow the Fuehrer through thick and thin to vic­tory and are you willing to accept the heaviest per­sonal bur­dens?” The crowd roared, “Fuehrer com­mand, we follow!” After the speech, Goeb­bels told Minis­ter of Arma­ments and War Pro­duc­tion Albert Speer that it was the best-trained audience one could find in Germany. 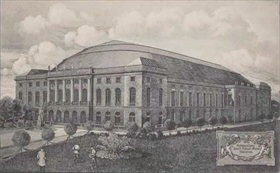 Right: This 1910 postcard depicts the newly opened Sport­palast in the Berlin suburb of Schoene­berg. 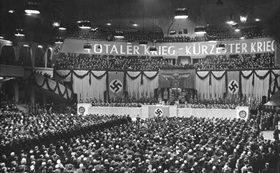 During the 1930s and 1940s, the Nazis used the vast in­door arena as their poli­tical grand­stand—“unsere Tribuene” as Goeb­bels called it—pre­venting its use for practi­cally any­thing else. Hitler spoke there on the ninth anni­ver­sary of his coming to power (Janu­ary 30, 1933), and Goeb­bels rallied the Ger­man Volk to “Total War” (totaler Krieg) on Febru­ary 18, 1943. On the eleventh anni­ver­sary of the Nazis’ seizing power, Janu­ary 30, 1944, the Allies bombed the building. Ever-resilient Ber­liners used the roof­less facil­ity for an ice-skating rink the following win­ter. After the war the building underwent restoration, only to be razed in 1973.